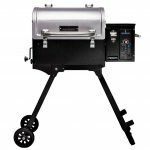 Wood pellet grills are very popular with outdoor chefs who want to create high level barbecue without all the fuss of tending a traditional smoke pit. Most of these grills use the same design, where a hopper and automated auger deliver premade wood pellets to a fire pot. An electric igniter and a fan maintain the fire, which drives hot air and smoke into the primary cooking chamber. 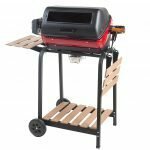 The big knock on wood pellet grills has always been that they exclusively use indirect heat, which means they can’t flame sear things like steaks and hamburger patties. If you wanted traditional grill marks, you had to improvise with a cast iron skillet. The Pit Boss 700FB answers this problem by adding a standard flame broiler feature. Operating it is relatively simple. 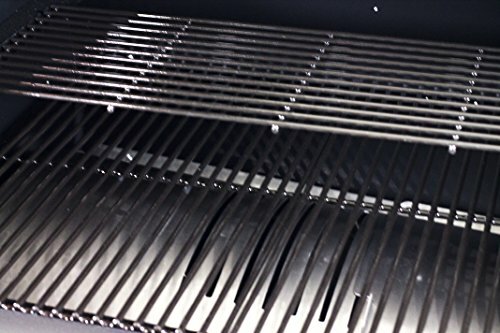 When setting up the grill, there is a sliding plate in the bottom of the main chamber. When it’s moved over the fire from the lower chamber can be used for direct heat grilling, just like you would get from a traditional charcoal or gas grill. The Pit Boss 700FB has a digital control attached to the heavy duty hopper. It allows you to control the temperature from a range between 180 degrees all the way up to 500 degrees. The hopper also has a pellet cleanout door, which allows you to remove unused wood pellets after you are done with a grilling session. While it might seem minor, it’s actually a really handy feature, as wood pellets tend to degrade if they are left exposed to high humidity or ambient moisture. With some other wood pellet grills, you have to awkwardly scoop the leftover wood pellets out. Pit Boss hangs their hat on the motto “Where Quality And Economy Come Together.” They live up to this fully with the 700FB. All the metal components are made from heavy-duty, thick gauge steel or similar high-quality materials. The cast iron grill grates are coated in a porcelain glaze, which helps with heat retention while also being nonstick and easy to clean. The wheels are made from steel, which means they won’t chip like plastic wheels. However, they don’t have any corrugation or tread. When you want to move it on your deck this isn’t a problem, but if you want to pull it across grass or another uneven surface the wheels don’t so much as they drag. When it comes to assembly, wood pellet grills inherently take a while to put together. Pit Boss did their best to make the 700FB intuitive to assemble. Just take your time reading through the assembly instructions. It shouldn’t take a lot of mechanical skill to get it assembled in a little over two hours. 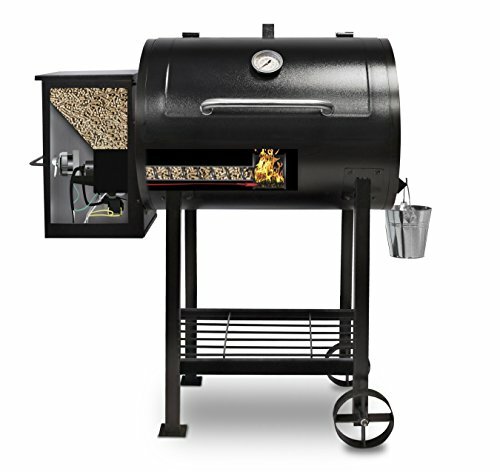 The Pit Boss 700FB is capable of producing competition level barbecue when it’s set up as a pellet smoker. It’s large enough to handle a full brisket, several chickens, and racks of ribs. If you want to smoke something tall and large like a turkey, the top rack pulls out easily. The ability to reach over 500 degrees means that you can make an amazing pizza. While you could make a fresh-dough pizza straight on the rack, it’s probably easier to place a pizza stone in there and let it absorb heat for 15 to 20 minutes, before placing the pizza on it. 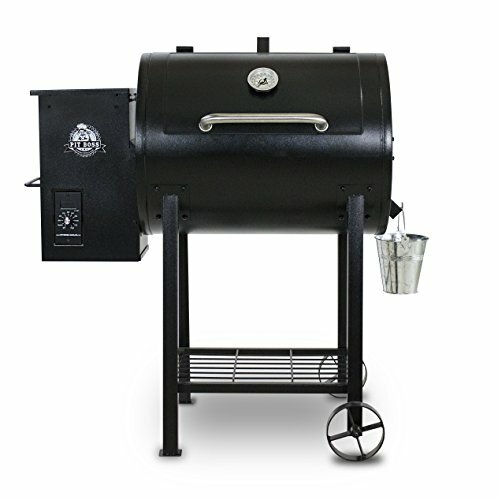 The place that sets the Pit Boss 700FB apart is the flame broiler feature, which allows yo tou use direct heat just like you would with a traditional charcoal or gas grill. Setting it up is as easy as adjusting a sliding plate in the bottom of the grill. One little problem with this feature is that you either have to set it up for flame broiling in advance. If you want to hybrid grill something like skin-on chicken breasts, you have to improvise with a long screwdriver to slide the plate over to shift the unit from smoking to broiling. A strange phenomenon that might come up is that the auger system seems to be set up to only use Pit Boss brand wood pellets. When you use a competitor’s pellets it can jam up from time to time. Whether this is an intentional design feature of just an accidental quirk isn’t clear. The primary grill grate measures 27-inches by 19-inches for 523 square inches of cooking space. The upper rack can be used as a warming rack or even as a secondary cooking rack for something like riblets. It is a little narrow, but it is 177 square inches and pulls out easily if you need to remove it. Combined the two racks give you 700 square inches of cooking space. 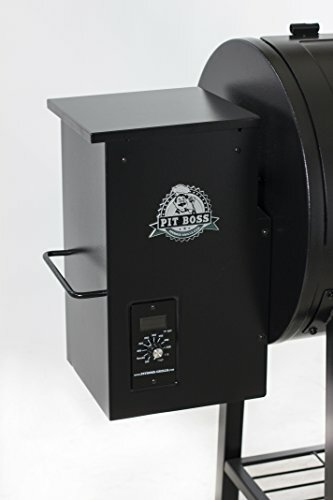 The Pit Boss 700FB does most of the things you expect from a quality wood pellet grill. The digital controller is nice for its relatively friendly price point. The integrated broiler sets the 700FB apart, as it gives you the ability to sear on direct heat. The pellet cleanout door is very thoughtful. It allows you to clean out leftover wood pellets without having to awkwardly scoop them out like you so often have to do with competitor grills. The Pit Boss 700FB is relatively easy to clean. You pour the reusable drippings cup out and gently scrape down the grates. If they’re particularly messy, you can soak them in soapy water and the porcelain coating will prevent any rusting or corrosion problems. One thing to pay extra attention to is the slide plate that operates the broiler. Make sure to clean out any drippings from around it and give it a couple of slides to make sure there’s nothing trapped in the seams. The Pit Boss 700FB has a one-year warranty on the electrical system as well physical manufacturer defects on components. The paint, burn pot, grill cover, probes, and gaskets, do not carry a specific warranty. 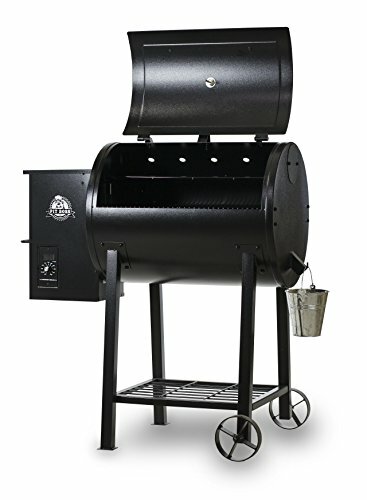 If you are in the market for a wood pellet grill for smoking and baking, but you still want to be able to do some direct heat grilling, then it’s hard to look past the Pit Boss 700FB. The broiler feature is something you rarely see with a grill like this. Pit Boss really does live up to their motto “Where Quality And Economy Come Together” with this unit. Wood Pellet Grill with an innovative broiler! Fueled by 100% natural wood pellets.